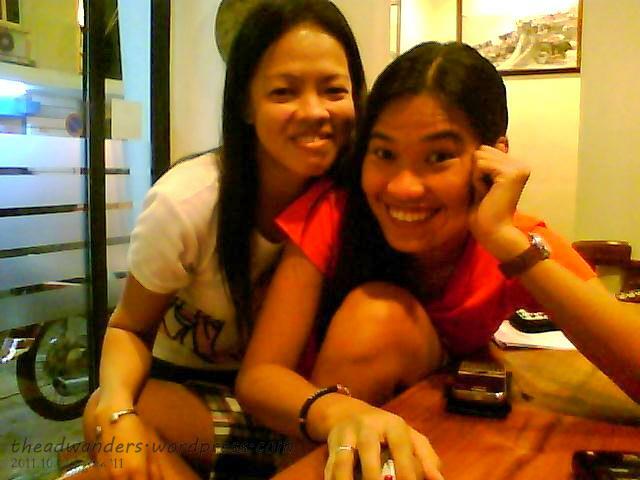 But before that, we went to his usual spot (like a local eatery) to have our lunch. Though it is blazing hot, I chose to have noodles. Zuldee did as well–he got chicken. 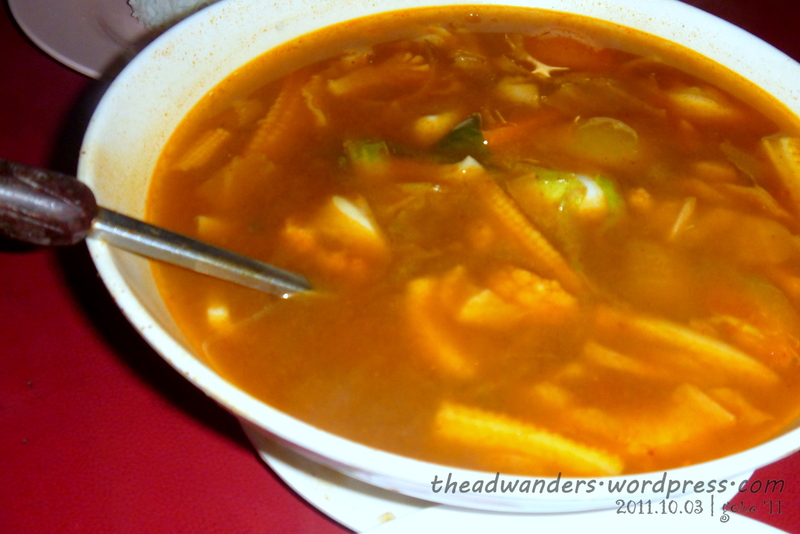 I forgot the name of mine but I think it’s as close to Iloilo’s Lapaz Batchoy as possible (it’s beef though, not pork). 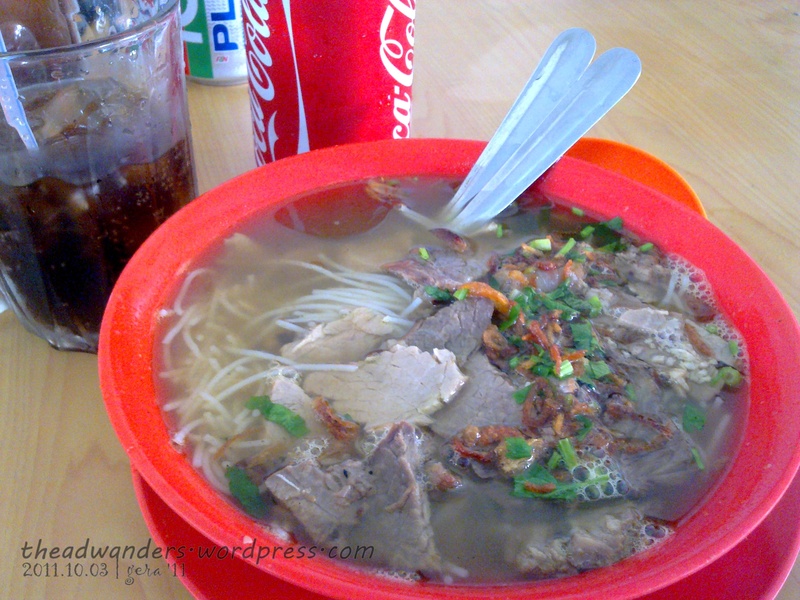 Beef in Rice Noodles and good ol’ Coke for lunch! 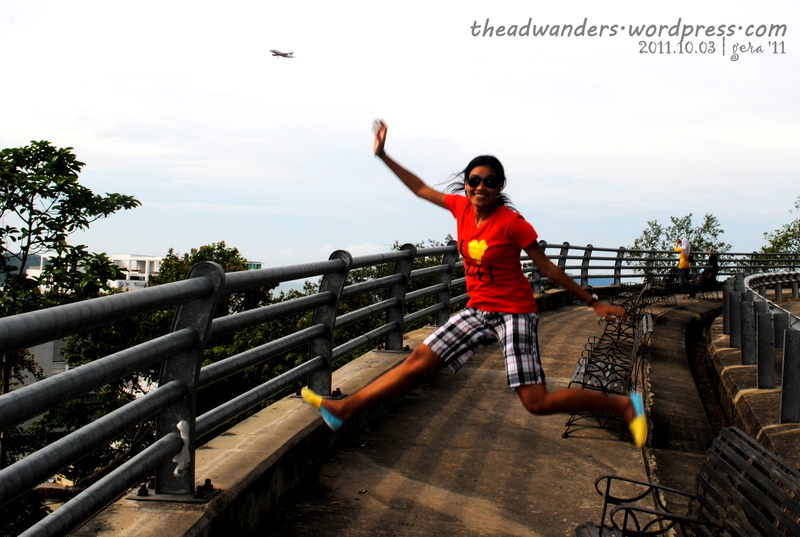 After eating (I insisted to pay our lunch, RM 11.6), we decided to go to Signal Hill first. 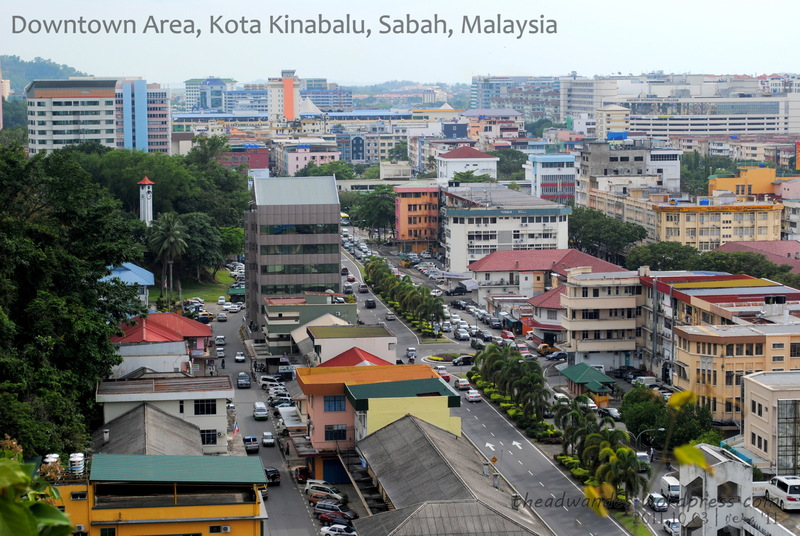 Actually, believe it or not, Zuldee does not know this place (since he lives outside of Kota Kinabalu, like 1.5 hours away). So, we had to rely on the map (readily available from the hostel). I’m sorry if I can’t tell you how to get to Signal Hill or Atkinson Clock Tower via public transport. 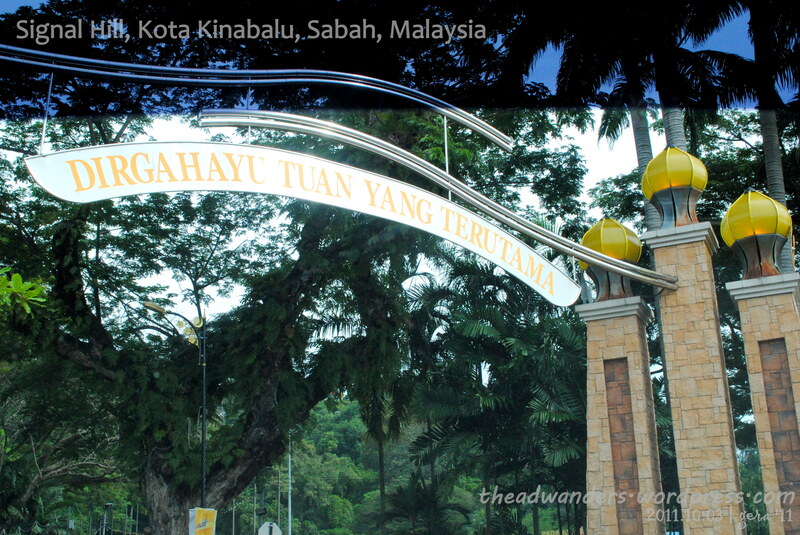 The entrance though is marked by an arch with Malaysian words inscribed (kindly give me a translation if you can) and yellow-bulb/headed posts in both ends. 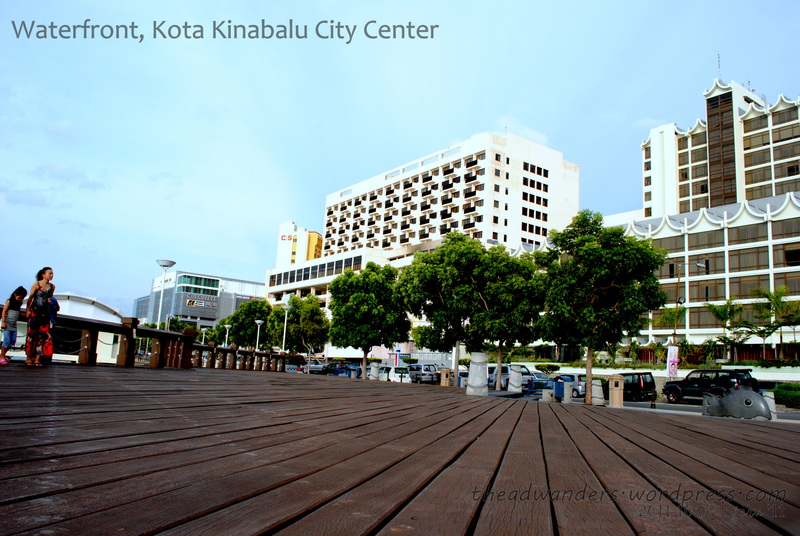 Downtown Kota Kinabalu–can you see the Atkinson Clock Tower? The climb is not too steep and I think it will be quite easy to go up (like Lignon Hill in Albay trekking style) especially with the paved road. After having my fill of KK City view (and I think shouting or yelling “Hello KK!” on top of my lungs), we decided to descend and see the Atkinson Clock Tower. 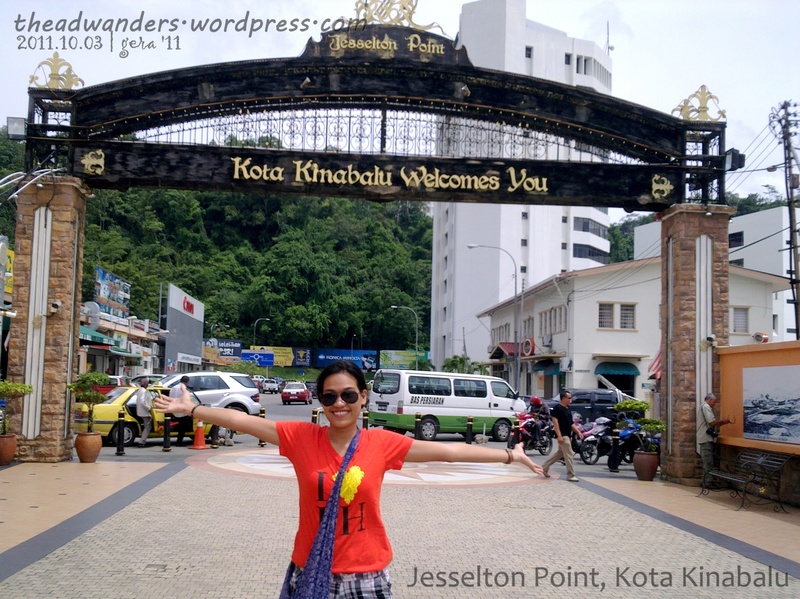 This tower was a memorial to Francis George Atkinson, the first district officer of Kota Kinabalu when it was still called Jesselton. Construction began in 1905, three years after his death from malaria. 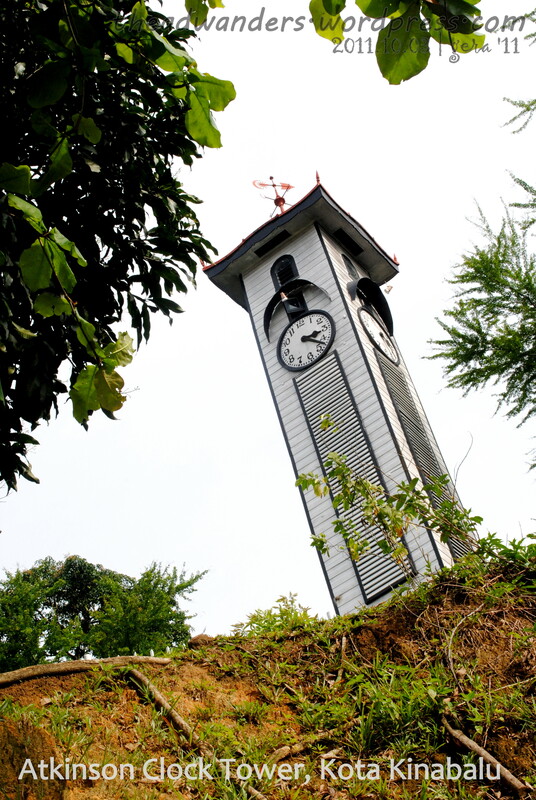 Standing at 157 meters, the Mirabau wood clock tower is one of the three surviving pre-World War II structures left in Kota Kinabalu. There are also three clocks in the tower. Repairs and renovations are being planned and implemented by the Sabah Museum. Surprisingly, it still tells the right time. Amazing! 🙂 There are three clocks with different times. I’m not sure which country’s time the other two are showing. 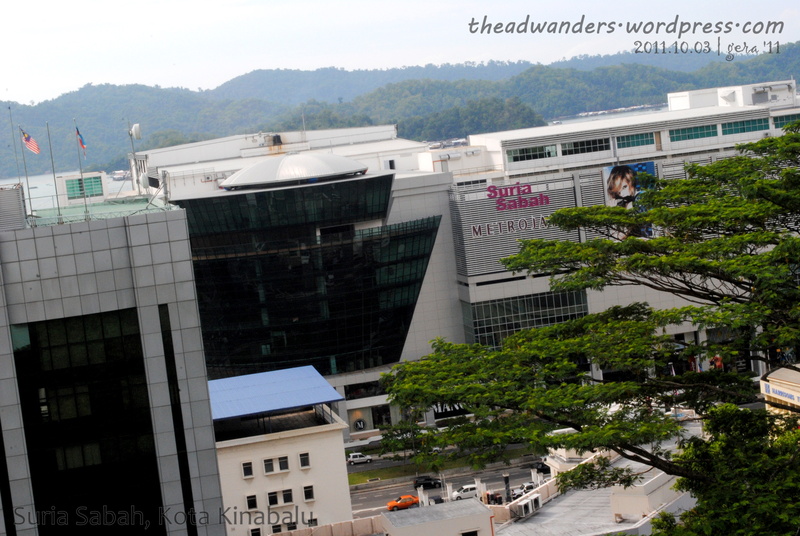 By this time, there was already a bit of a traffic around KK City Center. But you know, their heavy traffic is like moderate traffic along EDSA in Metro Manila. And after getting out of the city area, the Jalan Bandaraya is as free as NLEX. Heading towards this direction, the left side will be the bay and the Masjid can be found on the right, in the way heading back to the city. 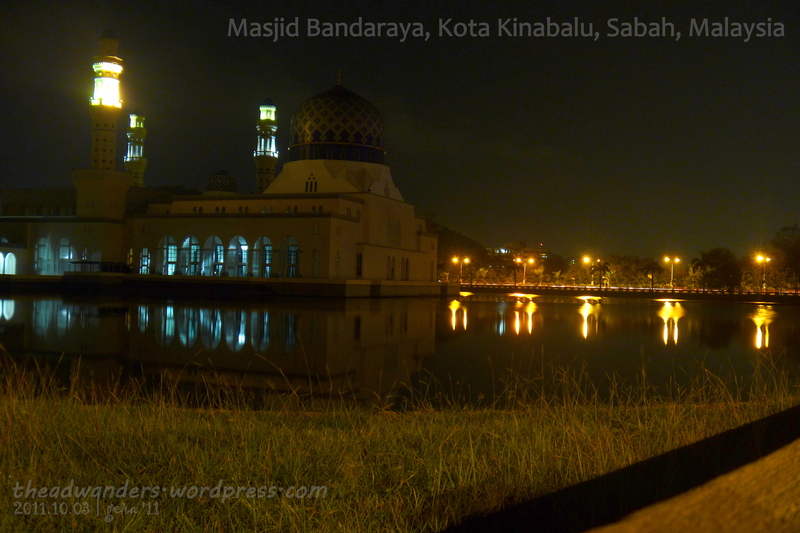 The back of Masjid Bandaraya is bordered by some sort of a lake or a big pond. I’m not very sure if it is man-made or what. 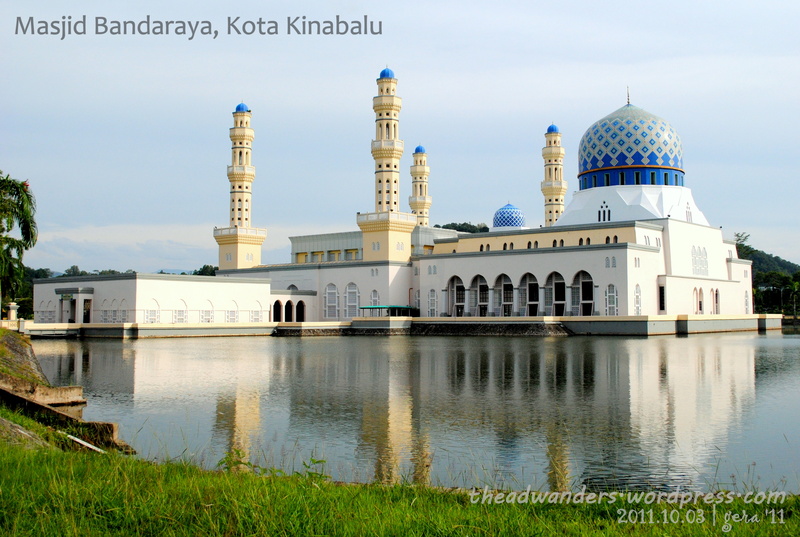 It’s a serene and wonderful sight, the blue dome and sort of yellow towers and white walls being reflected by the mirror-like calmness of the water. Never mind that it was scorching hot and I’m sweating and getting darker by the minute while getting these photos! After this, we went back to the city center for more photos at the Waterfront Area. I swear, it’s really nice just to stay here and walk around, or do people-watching. Zuldee made some business calls (he’s a contractor for house, buildings, government offices, drainage stuff, etc.) while I take my pictures. After that, I asked him to join me for a souvenir photo op with the blue marlin (or is it tuna) statue in the roundabout area. 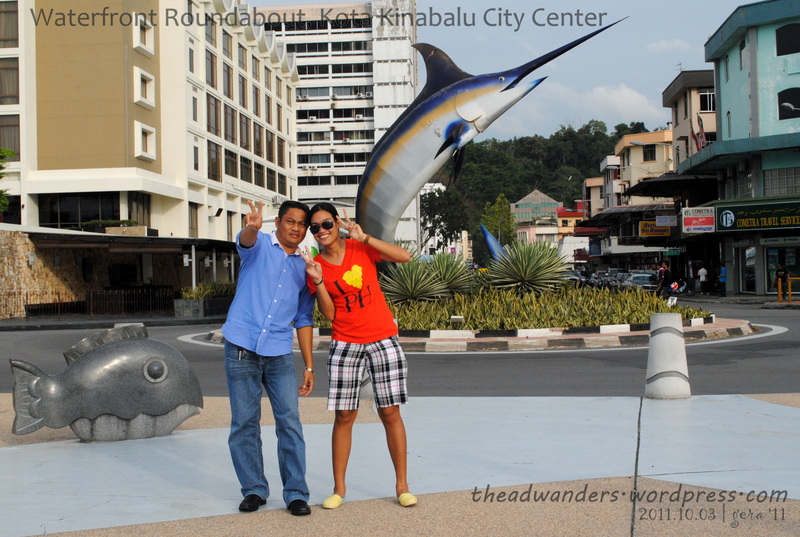 Waterfront Roundabout–the most famous fish in KK! 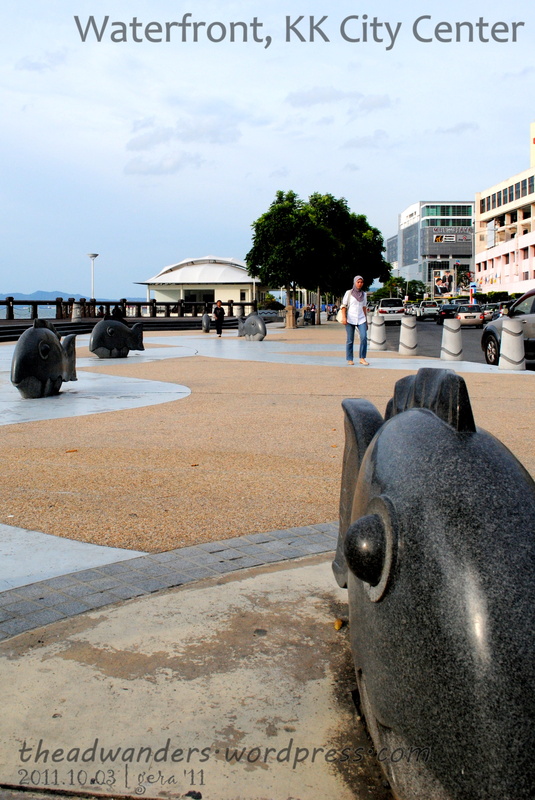 I think fishing is a big industry in Kota Kinabalu and man, their seafood are good! Everything is fresh and I think quite cheap as well if you’ll compare it to local prices. You can go to the white stall area and see them prepare the food for you! 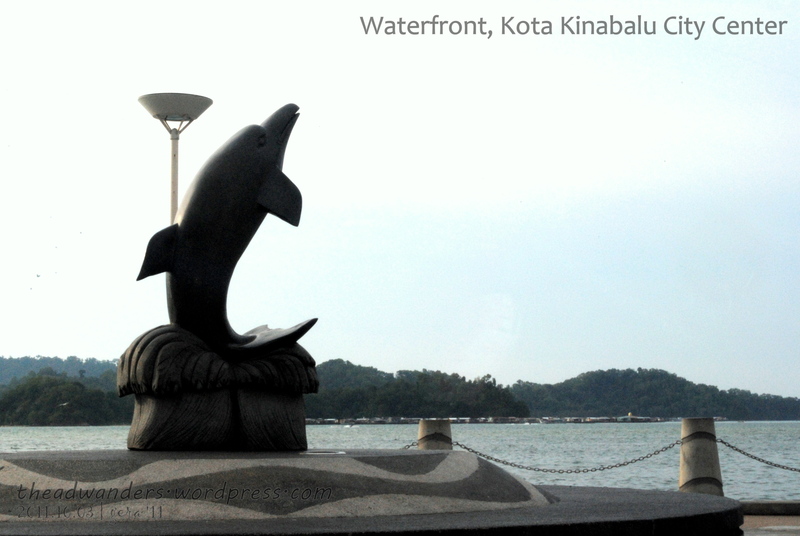 There was also this statue of a dolphin which I noticed only later on. I hope dolphins are not being caught and sold at the white stalls as well! After the Waterfront, we went to a mall (no, not Suria Sabah) to find a flash drive since I know i’ll soon run out of memory for both cameras. I also wanted to get some souvenir stuff already since I will leave for Brunei early in the morning. I found it quite odd that the 16GB flash drive is only RM60 while the souvenir shirt is at RM26. I mean, weird. Usually, souvenir shirts of that quality will only cost about RM10-15 max. Oh well, I must have a shirt and it’s cute anyway so yeah, I still bought it. Haha. I bought a ref magnet and a key chain as well. Since we’ve pretty much covered what I wanted to do, Zuldee said he’ll just drop me off at Sensi and will wait for my text once my roomie Sally arrives from work. When I told him earlier that Sally hasn’t gone out much yet (she’s only been there for a week and working as well!) he said he’ll take us out to dinner later. In the meantime, I checked my mails and FB notifications. As usual. Hihi. I also chatted with the staff at the lobby, especially about my trip to Brunei the next morning. The Shanghai family was also downstairs, researching about where to stay in Kuala Lumpur as they are to leave the next day as well. I told them we’re supposed to stay at Pods Backpackers Hostel in the Little India are of KL once we get there the week after. Beth called them up and successfully booked. Yey! I also showed the 14-year-old girl what Facebook looks like since she wanted to see it. It’s banned in China but she says they have something similar. With roomie Sally for dinner at Corner TLC by the bay! Sally said she wouldn’t have known that such a place existed if not for tonight. She just usually stay at the city center area and it doesn’t seem like mass transport is readily available to go towards this direction. Too bad there were no lights for the shore, it’s almost pitch black except when the waves crash and you can see some sort of white lines. 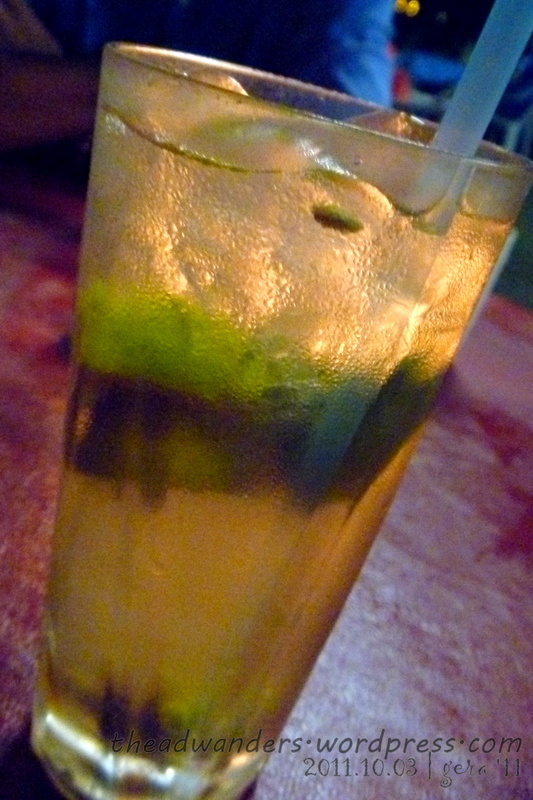 Except for the drinks, I think everything in the menu is in Malay. The waitress did try to explain in English what it is or to Zuldee and he would explain to us. 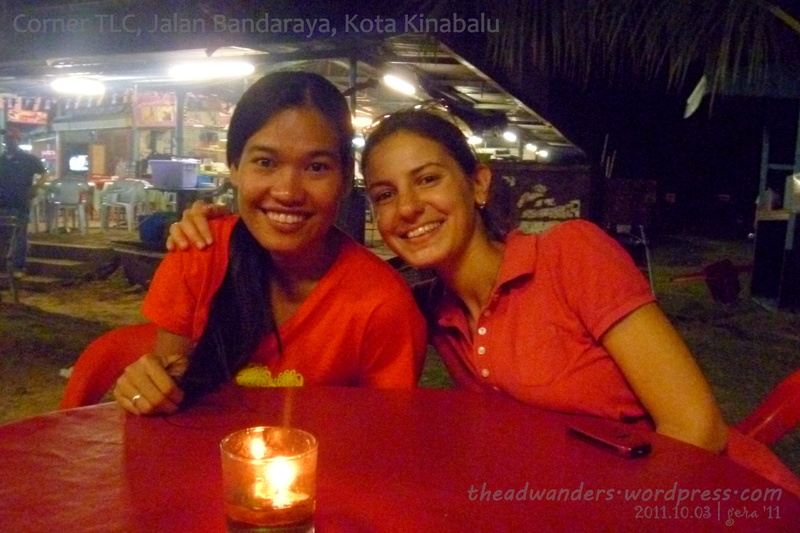 Sally knew some Malay words for food like sayur for vegetable and ikan for fish. I think pannas or padas is the term for hot/spicy. In the end, Zuldee did the ordering I think. Haha 😀 And he volunteered to be Sally’s Malay tutor if Sally will teach him English. Nice deal noh? 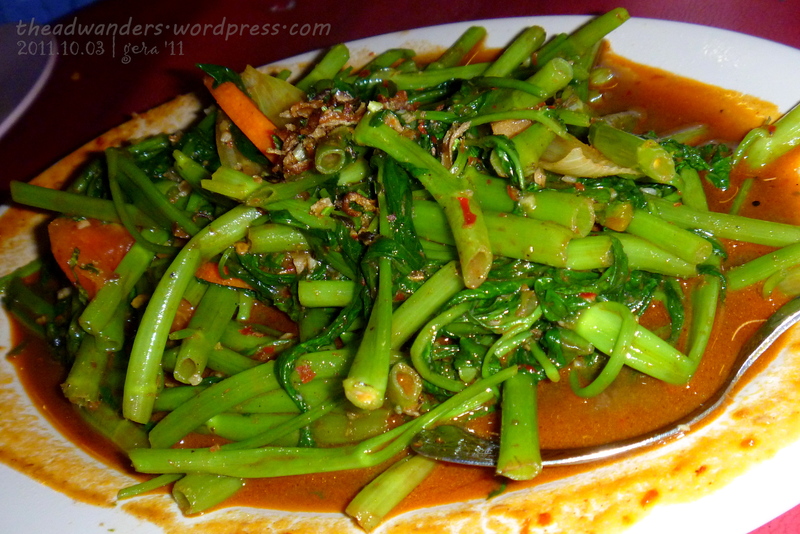 For veggie, we had this sauteed kangkong (swamp cabbage?) that is in heavy and spicy shrimp paste sauce. No, it does not, in any way, taste like the Kangkong with Bagoong side dish in Chowking. I think kangkong is a very common and important ingredient in Malay veggie dishes. I had it in Brunei as well. The fried shrimp was kinda interesting for me. I mean, it’s a normal shrimp that was breaded with flour and all, much like in a tempura. The veggies as well. What was interesting is the curly, shreddy, fibry things on top and around. 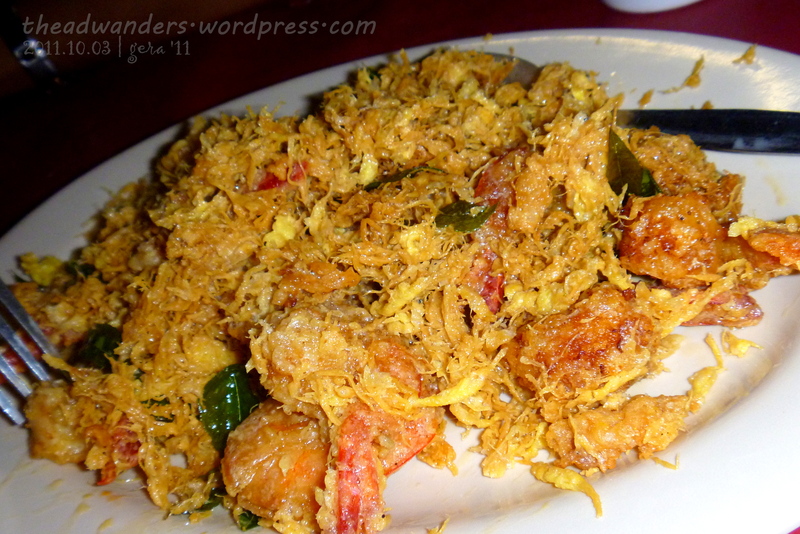 We can’t pinpoint what it is so we just assumed that it’s fried coconut shreds. It was kinda sweet and milk-ish. After dinner, it’s paying time! Sally and I reached for our pockets and bags but Zuldee stopped us. He’d pay he said. In fairness to me and Sally, we did try to insist but he just said never mind. We then agreed that we’ll have coffee or tea back in the city (I think we would have preferred beer but Zuldee does not drink. Hehehe). He already called his driver (who’s back at KK City Center) to find a way to pick us up. 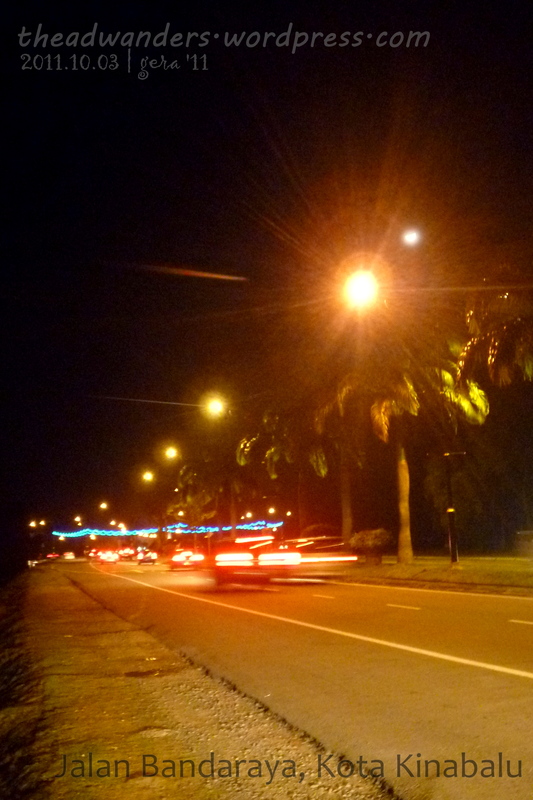 I wandered around to take photos of the night road. I was taking some more shouts when Zuldee broke into laughter and Sally joined in. When I got there, Zuldee realized that the car he was trying to open IS NOT his car. Stupid, he said. And we all laughed together! I did tell you that the car he drives is quite popular right?! 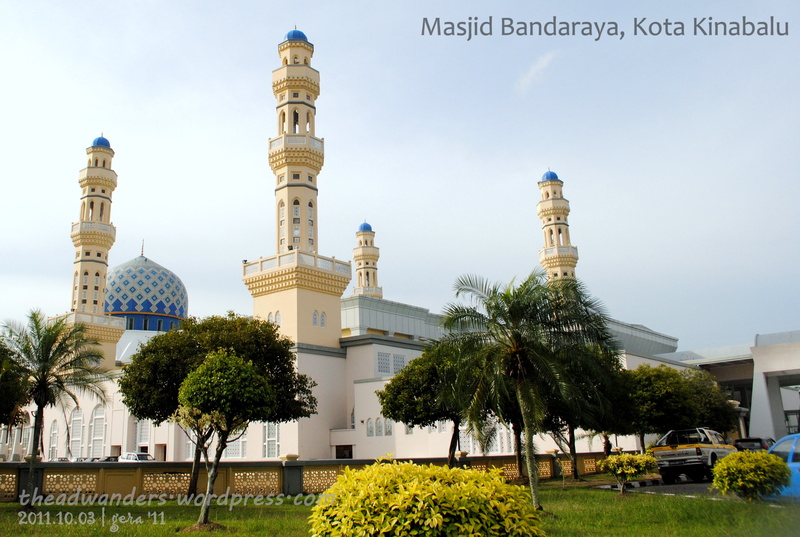 On our way back, and still laughing, we stopped a bit at Masjid Bandaraya again. 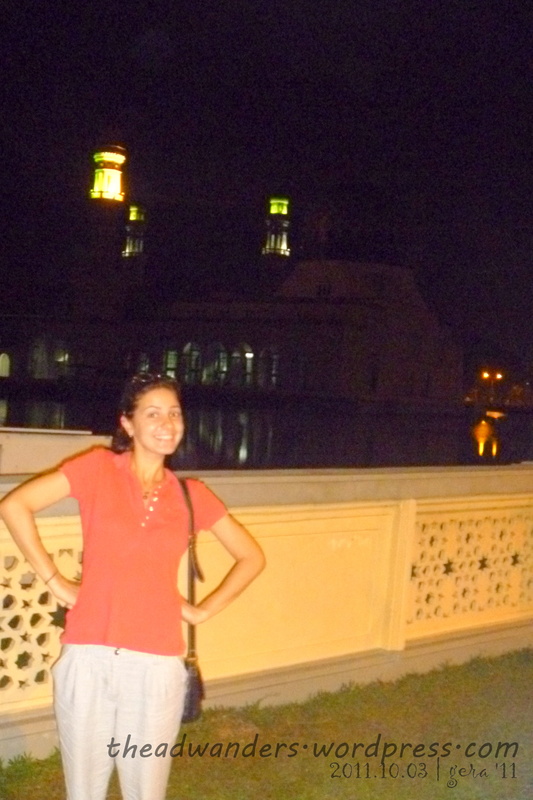 It looked different at night and it was Sally’s turn to have her photo op with the Mosque. She looked so cute. :p We were even thinking of crossing the fence/wall but decided we might get caught if we did and chose not to risk it. Hahaha. :p Zuldee opted to stay in the car since he feared the electronic thing really may not be working and we’ll have a panic time again! We encountered a bit of a traffic jam when we went back coz there is some kind of checkpoint. They didn’t really stop our car but I think Zuldee was motioned to drive slower, given that it was night and all. 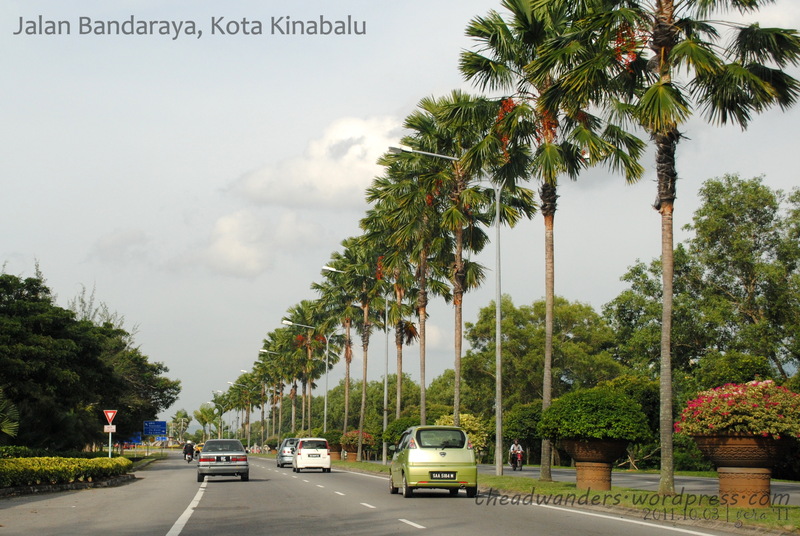 As we return to the city, there are also police men in strategic areas which made Zuldee say, “KK Police, good. Manila police, no good.” I wasn’t able to muster a reply. Heading back to the city! It was pretty late when we got back and there was no time for coffee or tea anymore, especially since he has 1.5 hours more ahead of him before he reaches his place. And so, we said our goodbyes. I think Sally and Zuldee exchanged numbers for their tutorial lessons. Zuldee repeated his offer to contact him if and when I return to KK. We’ll go to Kinabalu National Park next time he said, when Ning arrives and before Sally goes back to London on December 18. Thanks for sharing. You make KK look fun!! well, it is! it may not be everyone’s cup of tea but I liked it. I wish I had a little more time though. More time, more fun!